Today is Thursday, April 27, the 117th day of 2017 in the Gregorian calendar, with 248 days remaining. 1,364 days until the end of Donald Trump's term as President, assuming he doesn't resign or is otherwise removed from office. 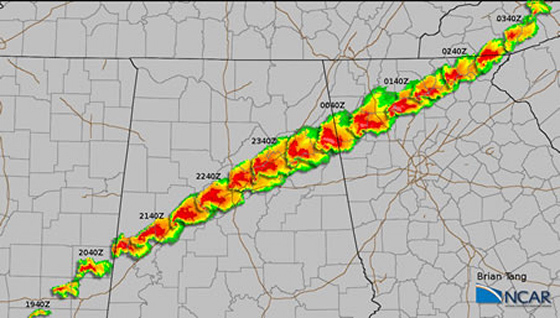 On this day in 2011, the 2011 Super Outbreak devastates parts of the Southeastern United States, especially the states of Alabama, Mississippi, Georgia, and Tennessee. 205 tornadoes touched down on April 27 alone, killing more than 300 and injuring hundreds more. Among other things, today is also Take Our Daughters and Sons to Work Day. Police arrest wanted Florida woman after she posts a Facebook live video from a Chuck E. Cheese restaurant. "Before you speak to me about your religion, first show it to me in how you treat other people. Before you tell me how much you love your God, show me in how much you love all His children." "It is at this point like a law of physics. For every Trump action, there is an equal and opposite Trump [videotape] clip." Seth Meyers continues to be the true successor to Jon Stewart. Drinking four cups of coffee is probably safe. Swell. Let me know when you get to ten. Dan Rather's second coming... Facebook, satellite radio and mainstream cable are resurrecting the veteran newsman's profile. A 600 year old white oak tree in New Jersey succumbs to old age or climate change or just bad luck. Making a mesh of things... An alternative to a plain wifi router if you have reception problems in your home. AT&T launches fake 5G network in desperate attempt to seem innovative. Note it's called "5G Evolution," which isn't really 5G. And it's only available in certain parts of Austin, Texas on Samsung Galaxy S8 phones. And the press release for it, which claims it's twice as fast as 4G, includes the disclaimer, "forward- looking statements that are subject to risks and uncertainties, and actual results may differ materially." File this under typical corporate dishonesty and forget about it. Trumpcare is back in the House, tweaked to make it more palatable to extra- conservative Republicans. How bad is this stinker? The new amendment says that none of the changes may apply to the insurance for members of Congress and their staff. I'd say we're screwed, but there's no way this is going to get through the Senate. And to make it even more interesting, repealing Obamacare could violate international law. I have personal experience and can confirm this: Juice is bad for you.